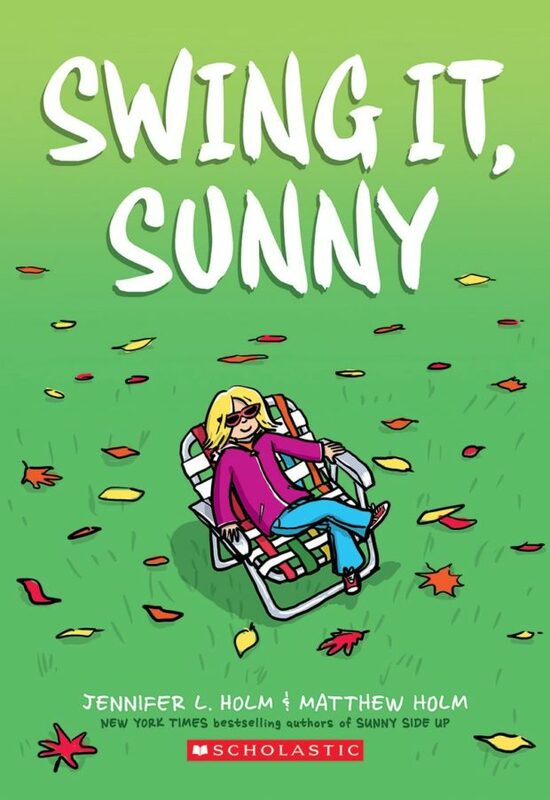 GRAPHIC NOVEL REVIEW 65/365: Swing It, Sunny – SCHOLASTIC WEEK! Scholastic Week continues with the sequel to yesterday’s book Sunny Side Up. Please start with that review by clicking here. Yesterday, I teased this review. I was wondering if like the Raina Telgemeier books, the Jenny and Matt Holm books would be a collection of themed graphic novels that fit a particular time and place. To my surprise, Swing It, Sunny is a straight up sequel to Sunny Side Up and should be read as part two in the series. I’ll be straight here. I feel a bit bad with the constant comparing of these books to Raina’s books. They are their own entity, and while there are slight similarities, and they may share a fan base, and Raina does have a quote on the Holm’s book jackets, these stand by themselves, and the construction of Swing It, Sunny as a sequel helps make this series stand out. After reading the second book, it also makes sense to mention that the books are told through a series of very short chapters that increase the pace of the read but also help slow the story down into bite size bits. And these bits are unlike anything that appears in Raina’s books, further separating the authors. As someone currently working on a zombie-type book, I know that, if it ever hits the light of day, I will get comparisons to many other titles out there; however, if I do get compared to titles like The Walking Dead, I’d have to take that as a win considering how popular that series is. So, I get the blessing and curse of big shadows…and I hope to get it even more in the coming years! 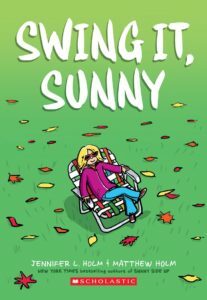 Swing It, Sunny follows many of the same themes as the first, but as Sunny grows up a bit, we get to see her develop a unique relationship with neighbors, her parents, and her brother that did not exist in the first book. Jenny and Matt Holm create a fantastic sequel that seamlessly continues the first book while growing and developing characters in ways that keep the series new. Check it out, but make sure you read Sunny Side Up first! Read them both in one sitting; you will dig them!